Some ground has been selected for you to search for gold. Core samples and metal detectors have created an accurate picture of what the underground environment looks like. The data has been simplified to an n x n x n cubic grid of soil, rock, and gold. Soil can be dug. Rock is impossible to dig through. Gold can be obtained by digging to it. Digging for gold can be a long and labourious process. Fortunately for you, a software-driven digging rig is making the task programmable via remote control. With your special digging rig, you may dig from your current location to any adjacent location. However, you can not dig upwards. You start at ground-level, and you may never dig off the cube. At any time you may bring your rig back up to ground-level and repeat this process. Your task is to remotely gather as much gold as possible. The first line of input contains a single integer, n (1 ≤ n ≤ 10), representing the size of the cube. The next line is blank. n lines of n characters, each Soil (.) Rock (X) or Gold (*), followed by a blank line. The levels are listed, in order, from ground-level to the deepest level. On a single line, an integer representing the amount of gold you can retrieve. If no gold can be dug, then output 0. The following route is taken to get 3 pieces of gold. Diagrams and an explanation are on the next page. In one dig we can retrieve 3 of the 4 pieces of gold. The 4th piece can never be retrieved since it is surrounded by rock. Below is the data's corresponding diagram. 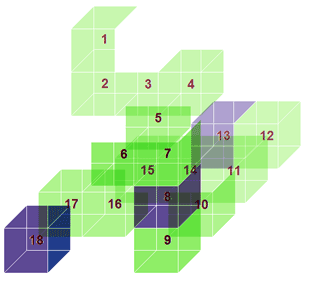 It is shown in 4 slices (whereas the test data is listed in 4 levels), which combine to form the cube. Green is the path taken. The number inside each green cube indicates the order of visitation. zhxl0903 on Jun 28, 2009 - 1:22:33 am UTC Can you dig from one slice to another? bbi5291 on Jun 28, 2009 - 2:50:22 am UTC Re: Can you dig from one slice to another? The input describes a n by n by n cube. It is broken down into n n by n slices only for the sake of input and to help you visualize it. You may dig up, down, left, right, forward, or backward (for some suitable definition of these directions). Can you dig gold if you are above it and dig down? tiamala101: The sample test shows an example of digging down on to gold (see step #8). I don't see what in the problem statement would make you think it's illegal. bleung91 on Nov 09, 2008 - 6:07:48 am UTC Is this significant? "At any time, you may bring your rig back up to ground-level and repeat this process? bbi5291 on Nov 09, 2008 - 5:31:45 pm UTC Re: Is this significant?